This is the third and final part of our 'Welcome to Jurassic China' series, which takes That's readers on a journey to explore prehistoric China and to meet the people who earn their keep studying, stealing and recreating the nation's long-extinct dinos. Click here to read about China’s ‘Pinocchio rex’ and here to read about China’s illegal dinosaur fossil trade. 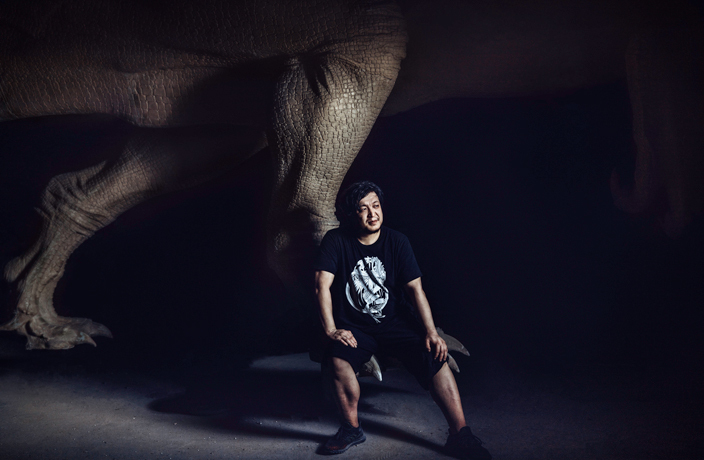 When scientists and researchers specializing in ancient flora and fauna need an artistic recreation of an extinct creature, they turn to Zhao Chuang. The Beijing-based artist is famous for his enthralling paintings and sculptures of dinosaurs, extinct mammals and other long-gone lifeforms. Zhao’s big break came in 2006, when his artistic recreation of a prehistoric gliding mammal made the cover of Nature magazine. Since then, his work has appeared in a number of influential publications, including National Geographic, and he’s on a first name basis with the rock stars of the paleontological world. Zhao has also been profiled by CNN and worked with a number of notable research centers and museums, including the American Museum of Natural History for its Dinosaurs Among Us exhibit. We caught up with Zhao to talk about his fascinating work. Your work straddles the boundary between art and science. How much do you rely on fossils and feedback from scientists when recreating extinct animals? The quality of discoveries varies based on which kind of fossils are found, so my paintings also vary accordingly. For example, Sinosauropteryx and Anchiornis, which were found in the western part of Liaoning province, are very rare discoveries. They died in a volcanic eruption and were wholly covered by very fine tephra that preserved their skeleton, feathers and pigment. So, in this situation, scientists did most of the work. Today, scientists use scanning electron microscopes to find traces of melanin preserved in dinosaur feathers and compare them to modern birds to discover the color of the ancient feathers. In these cases, science is 90 percent responsible for recreating the look of a dinosaur and the artistic work is focused on the animal’s gestures, or pose in the image. There are some dinosaurs, such as the Megalosaurus, one of the earliest dinosaurs to be discovered, that we only have a small percentage of the bones for – teeth and parts of the animal’s thigh and neck. For these dinosaurs, the artistic process is responsible for 70 to 90 percent of the final look of the creature. This practice occurs in most cases, as most dinosaur skeletons are very incomplete. A lot of your paintings profile dinosaurs marauding through a prehistoric world. What kind of research goes into recreating a prehistoric landscape in, for example, Xinjiang or Inner Mongolia? Take Liaoning, for example, we don’t need to do a field study in this case. There have been many studies on the paleobiology and geology of this region, as well as plenty of plant fossils discovered. The topography has been studied and the composition of volcanic rocks has been tested. For Liaoning, I mainly rely on scientists’ discoveries and scientific documents. In cases like Xinjiang, we need to go and take a look at the landscape and visit the dig sites. On one trip, I visited an area that scientists said was a big lake, although the exact size of the lake is unknown. So, we needed to do a field study to determine an estimated size by using measurements taken from different dig sites. It might have been bigger than Qinghai Lake and have been surrounded by fine sand, instead of sludge or rocks. Animals such as Hamipterus (an ancient species of flying reptile) would have nested and laid eggs here. In other instances, we need to test the soil texture. For example, in Henan and Jiangxi the stratum is reddish, and by coordinating with other study materials, we can say these regions were sultry in the ancient past and may have had lots of lakes and swamps. How often do you visit dig sites and see fossils and other prehistoric relics as they are unearthed? Very often. In recent years, I regularly visited sites in Zhucheng and Laiyang in Shandong province. Excavations in Laiyang are still ongoing and the scene there is stunning and very different from the norm. We used to think that dinosaurs were very dispersed and spread out, but in Laiyang, they lived together like the wildebeests and zebras on the African savannah; many different species have been discovered together. To the best of our knowledge, your education background isn’t in biology or paleontology. Have you picked up a considerable amount of knowledge in these fields through your work over the years? Of course, I have been doing this for over 10 years. But, the more I draw, the more I realize the information on ancient animals is lacking. I study every single day, because you need to acquire new knowledge from different fields – such as 3D printing. How long does it take to create one of your large life-size dino sculptures? These take about one or two months, depending on how sophisticated they are. If the scale is big, it’s easy – albeit delicate – work; but the preparation takes a long time. Generally, it takes about a dozen people to complete one sculpture. In the past, we had to make a small handmade model first, which took about two or three weeks, and then enlarge it. Now, with advances in technology, large models can be built faster. Yangchuanosaurus. Illustration courtesy of © Zhao Chuang from PNSO. What’s your personal favorite piece of art from your collection? I think my work will only get better in the future, but if I had to pick one, it would be the one that has had the greatest impact on my life: the ancient gliding mammal that was used on the cover of Nature magazine. After that image, many scientists approached me to work with them and that is when my career started. Sinosaurus. Illustration courtesy of © Zhao Chuang from PNSO. What is your favorite prehistoric species to recreate? And, in what medium do you prefer to use to bring extinct animals back to life: paintings, sketches or sculptures? Personally, I lean towards the T-rex because it was the first dinosaur I learned of when I was a child. I have always liked dinosaurs, and when I first heard about them, they seemed like monsters. T-rex was an actual monster on this planet and the species has had a great impact on me. As for preferred mediums, my favorites are oil paintings and large-scale models. If I had to choose between them, I’d pick the latter because the only way to convey the authentic form of these gigantic animals is by bringing back life-size replicas of them. Click here to read more from our ‘Wecome to Jurassic China’ series.